Four by Four Bhangra Group was established in 1994 with the aim of promoting bhangra the folk dance from the Punjab in Northern India and to work with young people through the arts around the county of Kent. Since its inception the group has gone from strength to strength performing at community events and festivals around the UK and Europe, and working with thousands of young people either through workshops or through regular sessions through the successful Four by Four Youth Club. Four by Four was established by Gurdish Sall, Marni Dhinsa, Suki Randhawa and Sunny Sandher who were the 4 original dancers and Billy Sandher who was the original dhol player. 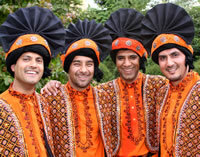 The founder members had previously performed with Jugnu Bhangra to much acclaim, Marni, Gurdish and Sunny between 1985 and 1994 and Suki and Billy between 1989 and 1994. From an initial membership of 4 dancers the group has flourished and is recognised as one of the leading lights on the bhangra dance scene. The group is recognised not just for its performances but also its hard work in the local community working alongside other community partners and faith groups to promote positive community relations around Kent. Its positive work with young people between the ages of 12-18 at its regular youth club sessions has won much acclaim from parents, service users and partners. The group also work with local partners to deliver free community events where arts from around the world are celebrated and positive community relations promoted. Four by Four have much experience of performing at corporate events having performed at various stages for many of the top Blue Chip Companies based in the UK as well as helping to organise and facilitate team away day sessions around team building and teaching people new skills. Four by Four are much in demand to deliver bhangra dance and dhol drumming workshops around the South East and create bespoke workshops depending on the needs of the educational establishment that we are working with. We can deliver from a half day session to a residency culminating in a performance at a community event. Costumes and instruments can also be supplied. Four by Four have performed at festivals both abroad and across the UK. The group can do everything from a straight performance to dance and drumming workshops to delivering workshops around how to put on the traditional bhangra outfit and to provide an oral history of bhangra dancing, its origins on the sub-continent to how it has evolved to now. Our strength at festivals is about getting the audience involved in our performances from the start. The Youth Club meets every Friday during term time at the Guru Nanak Arts Studio Khalsa Avenue (Off Trinity Road) Gravesend Kent DA12 1LU. 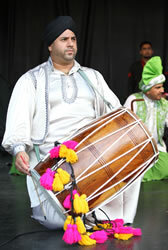 Bhangra lessons take place between 7pm – 8pm & Dhol classes between 7.20pm – 820pm. All classes are free.